We finally have cedar raised beds in the backyard garden area!! Yay! 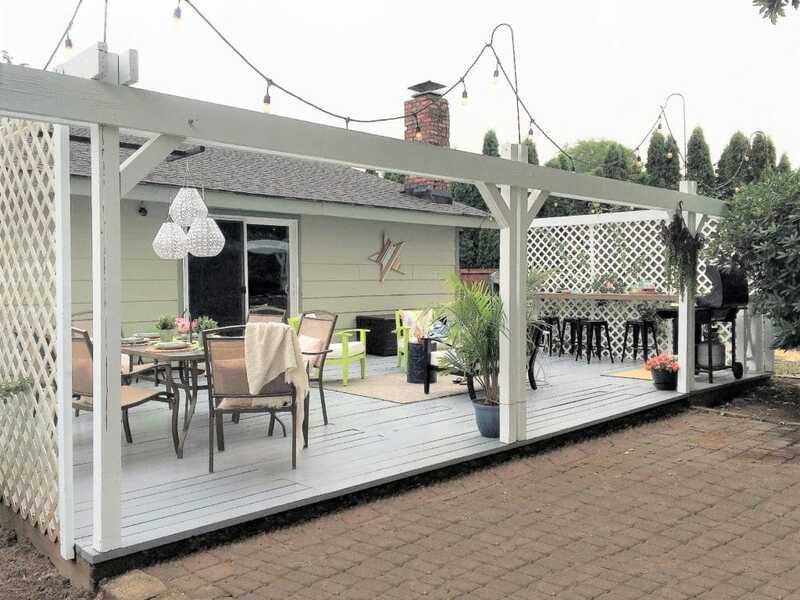 We are moving right along in our Backyard Makeover Chronicles and I am so exited to share with you all the progress we’ve made over the last month or so. In addition to a project update, I thought it would also be helpful to share with you the 5 main reasons we believe cedar raised beds are the best way to garden. 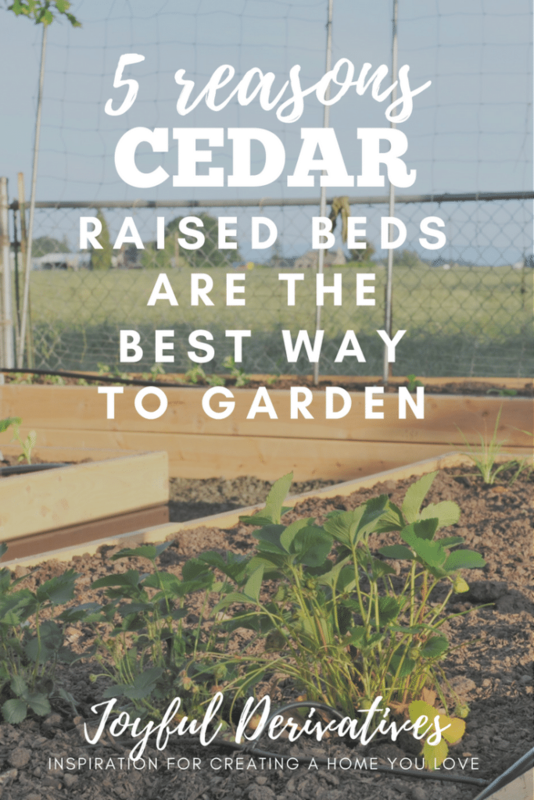 While there are well over 5 benefits to gardening in raised beds, I wanted to focus in on the ones we’ve experienced when it comes to using CEDAR raised beds. 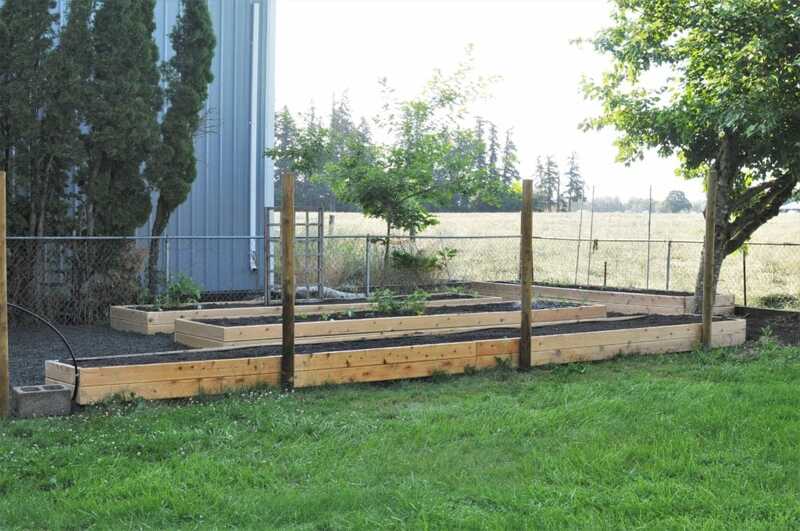 We are huge advocates for using cedar lumber in the construction of raised beds – whether they’re to hold flowers, vegetables, or even just greenery – and hope this post will enlighten you as to how much the material you build your beds out of matters. The materials for this post were provided by Mike’s Corvallis Bargain Center, but the opinions are all my own. 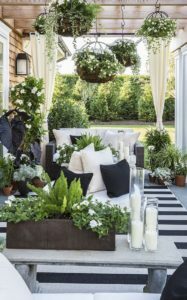 If you’re just joining us on this backyard makeover adventure, let me get you caught up! We purchased this house (with half an acre lot) about two years ago and have been working on the backyard for just over a year. Ah! So much has happened since I last updated you all on this project! Ok, where to begin… let’s start with the chickens. Not only did Chris finish up the fence around their chicken run perimeter, but we also got 4 new lovely ladies to add to our flock. 🙂 You’ve already met Ruby and Jane, but let me introduce you to Pearl, Opal, Babe and Black Pepper! Aren’t they so sweet? The kids LOVE them and it’s been really fun learning how to raise chickens from chicks. One of them laid their first egg this week – I can’t believe how fast they grow! 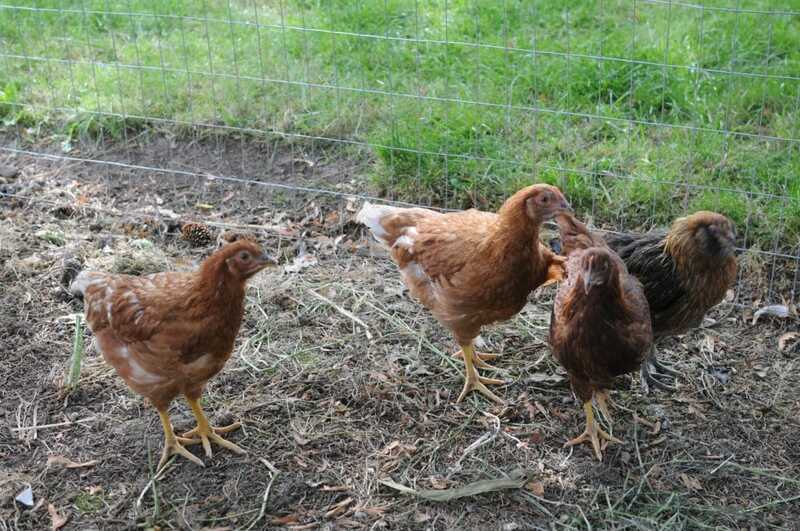 We purchased the two older ones when they were a few years old, so it’s interesting seeing how tricky it can be to introduce new chickens into an established coop. If you’re experienced in this process – please email me some tips!! 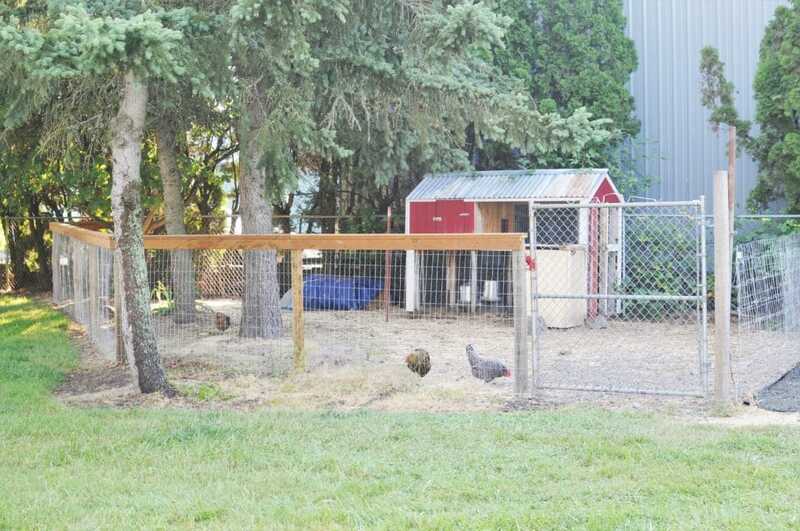 Here’s a view of their coop and run, with the fancy fence Chris built. 😉 They sure do love free-ranging in this large area all day! After Chris built the beds, then came filling them… Wowza – I did not think about how much work that would be! The past week has included HOURS of shoveling dirt and gravel (10 yards of each, to be exact!) My hands are super tired, but it’ll all be worth it when we have an abundance of veggies back there every year, right? 😉 We also made sure to install the watering system main line before filling the area with gravel, so it’s ready to hook up and set on a watering schedule after we’ve moved the spicket. Lastly, our most recent change in plans was choosing to use our large backyard shed as my soon-to-be office/she-shed rather than a barn… Remember what I said last time about the plan’s always changing?? 😉 At this point, we’ll have to either purchase a smaller shed to go back in the garden, build one from scratch, or restore one that we find used… We honestly aren’t sure what we’re going to do when it comes to the barn, but that’s ok! For now it’ll just sit with gravel between the chicken run and the gardening space. Before I get into the details about why we’ve gone to all this work to have cedar raised beds in our gardening area, let’s take a look at our project list progress! Next up is finishing the fencing, moving the spicket, planting the rest of the veggies and installing the rest of the watering system. Oh, and then there’s figuring out what we’re going to do for a barn… Still lots left, but it’s moving along! Ok, now let’s get into why YOU should use cedar raised beds for your gardening! 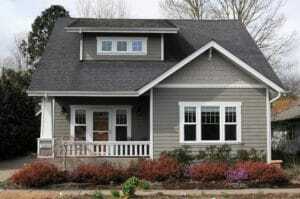 Cedar has a natural rot-resistant chemical in it that helps it resist decay and weather the seasons. When dry, cedar boards are tough and don’t split easily, so pre-drilling isn’t necessary when constructing the raised beds. Compared to other wood types, cedar is relatively lightweight. This makes it easier to maneuver when it comes to moving it from the store to your home, as well as in the building process. As a natural element, cedar lumber biodegrades well meaning, when you decide to replace or deconstruct the raised bed, you can easily dispose of the boards! I mean, this is why I like them best. 😉 Of course, a natural wood board like cedar will always look more appealing than its counterparts (like recycled plastic or composite) in a garden filled with greenery and other natural elements. So, what do you think? Ready to build yourself some cedar raised beds?? I can’t wait to see all the produce that section of our property produces in the years to come. Don’t forget, Mike’s Corvallis Bargain Center can provide you with cedar lumber, pre-built cedar boxes or even custom built boxes. No matter what you’re DIY-level, they can get you set up. I hope you all have a wonderful rest of the week – I’m off to shovel the last of that gravel before my sister and her family come to town this week!